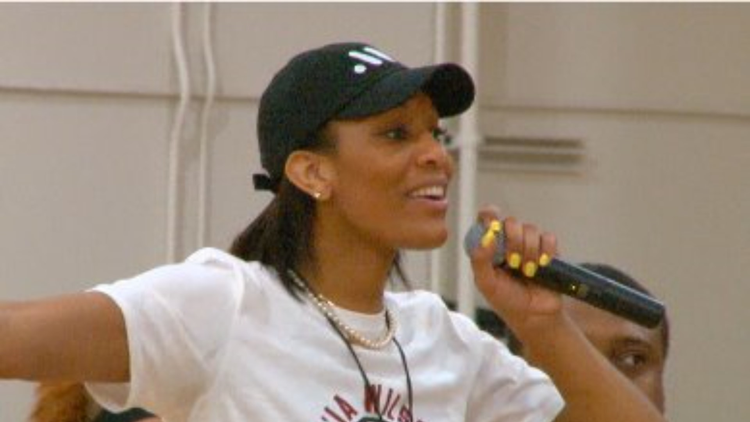 Las Vegas Aces Forward and former Gamecock star A'ja Wilson returned to her old high school to hosts here very first basketball camp. COLUMBIA, S.C. — Saturday at Heathwood Hall one of the top alums was back on campus. Las Vegas Aces forward and WNBA rookie of the year A'ja Wilson returned to her high school alma mater to host her very first basketball camp. "It really is full circle," A'ja said. "I love it. Heathwood has done so much for me and my family and for them to open up this gym and let me have the opportunity to run my first camp it goes to show how great a program they really are and I just love bringing back to my stomping grounds. This is where it all happened for me so I want these kids to build off something." With help from USC teammate and fellow WNBA rookie of the year winner Allisha Gray, her father Roscoe and her newly minted foundation A'ja was able to host a larger number players going from third to the 8th grade. "They're so competitive," A'ja said after observing some of the first games. "I mean the guys are like clapping and the girls are so into it. They're high-fiving. I told them I want you to meet a new friend when you leave here because that's what's it's all about . Friendships. Bonds. So to see them from not knowing each other to high five really shows the character that these young people have." A'ja was a rookie to doing camps and said it was a lot of work but it's all worth it when you give back and inspire local kids who have seen her at USC and now in the WNBA. "From planning to actually being here, it was a ton of work but I give it all to God. He really put something just special withing this gym and this arena and these kids and I love it."